i'm giving myself a big fat ZERO for creativity these last few days. monday even brought me to uggs. uggs! speaking of uggs, i got the fabulous, short, chestnut pair for xmas - just what i wanted, mammy! maybe i'll even wear them tomorrow...and the next day, and the next. right up until jan. 1st. 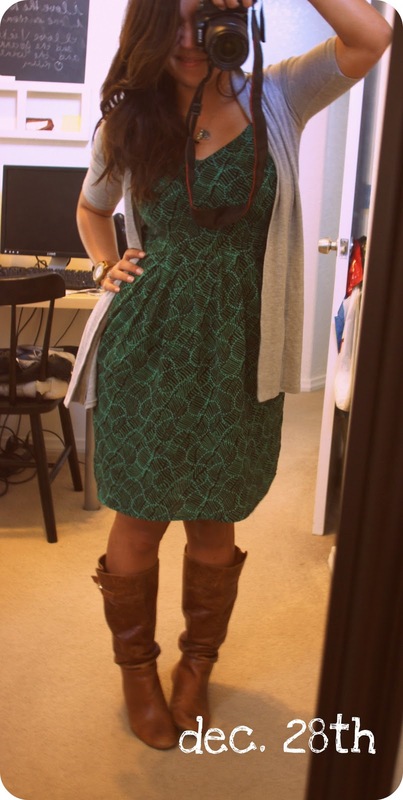 and today, while i know it looks like i just wore this dress (see prior post), i swear, it's been almost a whole week! i even washed it! ah, the accomplishments. do my legs look broken or is it just me? christmas is funny! and super late. Fly me to the north pole? the daily mention, back with black. tomorrow = sunday and the big news!